Thank you for this article. 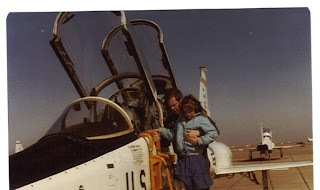 As a widow of a T-38 fatal crash in 1991, I can tell you it has been tough. I was 3 months pregnant at the time, and also had a 7 year old. This was also during the Gulf War. I had to endure many parades of people coming home, but never a parade for those who gave the ultimate sacrifice of their lives... It was tough. My kids are grown, now, and I'm happy that people like you give praise for those fallen heroes. I'm sure they will come across this when they are older, and appreciate the time you took to write this article. Thank you so much Teri for your comment and service as a military spouse! You have our condolences for your loss many years ago that I am sure you still feel each and every day! I am sure that your children appreciate the time you take to remember their father!